Our Gordon Elliott approach paid off again yesterday with two winners at 7/1 and 2/1 from 7 runners for a 4 point profit for a 57% return on the days investment. Gordon Elliott has another 7 runners today, there are a couple of interesting factors that might effect your decision to bet. First off Tico ran yesterday, started favourite and finished 23 lengths last. The high level stats for all horses running in National Hunt races one day after their last race is 13% strike rate from 583 that have tried in the last 10 years. The strike rate for Gordon Elliott trained runners that have run after one day is 23%. 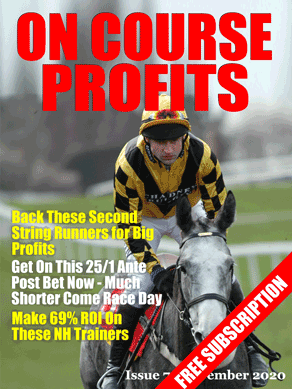 The strike rate for horses that ran one day ago in a hurdle and today run in a chase is 20% with a 62% ROI. Gordon Elliott has done this twice and one of those runners won. Before I looked at the stats I was thinking I would drop Tico from my days bets, but having checked the numbers I think I'll leave him in. The other runner that stands out is Crown Theatre at 40/1. Gordon Elliott has had 18 runners at Perth that started at 22/1 or bigger, none have won! Today we have our regular weekly column from Malcolm Pett of GreyHorse Bot. As you are probably already know the chances of a favourite winning a race is around 34%. That figure can be influenced by other factors like race type and price and can drop to around 27% or rise to over 50%. So why would I mention favourites? We know there is no value in following them. So what about if we look elsewhere? What’s the win averages of the other runners? Again this is based around all race types and all prices. This means that nearly 80% of all winning horses come from one of the top 4 priced runners in a race. In my last Daily punt article I talked about what I call “Nano” systems. This is where you look for specific types of races where you may be able to find profit. So here is another example you may want to check out. Using the SPB System Builder I found a trend based around 6 year old horses in class 6 running at Southwell. If they have won at Southwell before at the exact (exact) distance they are running at again and they are favourite…then they have won 54 of the last 100 (qualifying) races resulting in a BSP profit of 37.46 points. The system also appears to work at Kempton and Wolves but not to the same extent as it seems to at Southwell. So although blindly following favourites is not a profitable pastime there are places you can find that appear to show a return. Finding high strike profitable trends is interesting but as you can see you have to be pretty specific about the runners you choose.